Maya beach house in Maya beach - a secluded getaway with a beautiful, private beach front villa located in Maya Beach on the Placencia Peninsula..
a secluded getaway with a beautiful, private beach front located in Maya Beach on the Placencia Peninsula. 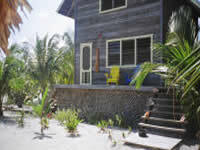 Enjoy the Caribbean Sea a few feet away from the deck of a beach house, relax in hammocks on the dock... If you want some adventure and activity, experience the world's second largest barrier reef in Belize... diving, snorkeling, fishing, sailing, kayaking, cave tubing, ancient Mayan Ruins, the jungle, rainforest, hiking, waterfalls, exotic wildlife preserves, birding , tropical flora and miles of sandy beaches. 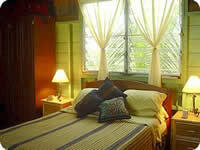 Prices given are for double occupancy. 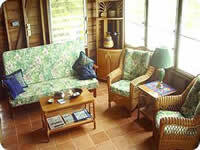 Add additional $20 USD per person per night. Maximum 4 people per house. Located at the northern end of Maya Beach, the narrowest part of the Placencia Peninsula, in the Stann Creek District, Ocean's Edge is approximately 100 miles south of Belize City and 6 miles north of the Placencia Airstrip. Our beach front property consists of 2 spacious beach houses, the Ara Macao and Blue Tang, and our groundskeeper's house. A wooden sidewalk provides easy access from the road to both houses as well as a view of the beautiful tropical plants on the property. 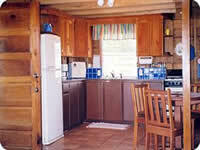 We will stock your fridge for your arrival with fresh fruits, vegetables and beverages if you desire. Beef, pork and chicken can be purchased at the local Maya Point Market. You can purchase fresh produce from local vendors that stop by the property twice a week. Additional food and seafood can be purchased in Placencia Village, approximately 8 miles south on the peninsula. If you prefer restaurants, there are a couple within walking distance of Ocean's Edge, and many more options as you go further south along the peninsula. Our managers, Bill and Adriane will greet you to settle you into your temporary home, book any tours you may be interested in and are available for any questions you may have. Wander into the safe, shallow water off the beach, relax under the shelter of the breezy palm trees, the cooling shade of a palapa or in a hammock on the beach. Ocean's Edge is your perfect secluded tropical paradise! experience the world's second largest barrier reef in Belize... diving, snorkeling, fishing, sailing, kayaking, cave tubing, ancient Mayan Ruins, the jungle, rainforest, hiking, waterfalls, exotic wildlife preserves, birding , tropical flora and miles of sandy beaches.